Study reexamines the Amazon region’s ‘cornerstone of conservation’. Want to invest directly in the preservation of the Amazon? Buying Brazil nuts might well be your simplest strategy, says Peter Cronkleton, coauthor of a new study that assesses Brazil nut exploitation from a socioecological perspective. The weighty, nutritious nuts seem something of a poster child for the concept of ‘conservation through use’. The trees they grow on are Amazonian forest giants that can reach over 50 meters in height and live up to 400 years. 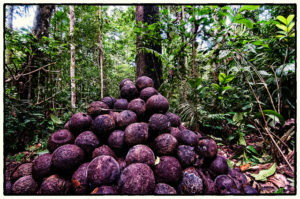 The softball-sized fruit – each containing around 20 nuts – are collected from the forest floor in rainy months by forest-based harvesters, who maintain customary rights to the resource in many areas. As coauthor Amy Duchelle confirms, “it’s something that’s sustaining thousands of families in that region, while essentially giving value to standing forest.” It’s a relatively sustainable system, she says – but one that’s under threat. 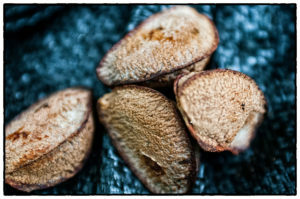 The southwestern Amazon region in which most Brazil nuts grow spans three countries: Brazil, Bolivia and Peru. Prior to the 20th century, the area was not clearly defined by national boundaries, but was held by rubber barons and populated by their laborers, Cronkleton explains. In neighboring Pando, Bolivia, communities are much more reliant on the Brazil nut harvest, as it’s “really one of the main livelihood activities they’ve got going on,” she says. There, a more pressing issue is contested and incomplete titles to Brazil nut tree stands, which make it difficult for residents to claim and defend their resources, adds Cronkleton. Read more: What’s in a land title? While Brazil nut trees are protected from logging by law in all three countries, intensive deforestation in surrounding areas can affect the productivity of the trees, explains ecologist Pieter Zuidema, another coauthor of the study. It can also affects harvesters’ ability to cope with the high natural variation in Brazil nut tree productivity from year to year. 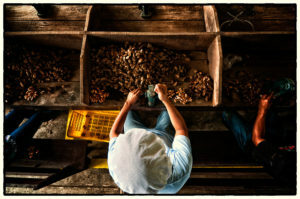 Usually, in low-yield years, “what Brazil nut harvesters do is go deeper into the forest [to look for nuts]. With increasing deforestation, that potential is not there anymore. So it reduces the resilience of the whole system,” says Zuidema.